Unique oval 19th century Biedermeier writing table, Hungary circa 1820-1830, bird's-eye maple veneer, burl walnut and elmwood veneer with akanthus leave marquetry on the top. The table has one drawer. Great design with beautiful details. The table is in very good condition. Three Biedermeier chairs, Germany 1820-1830, cherry veneer. In original condition. 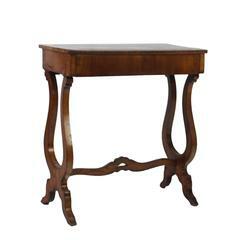 Walnut single drawer writing table. 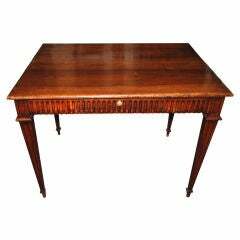 19th century Biedermeier writing table with bone inlay on each corner and a single drawer. 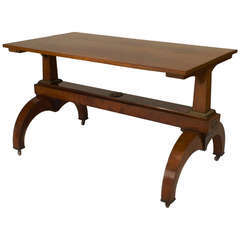 Nineteenth century Austrian Biedermeier bronze-trimmed walnut davenport table resting upon rounded pedestal base sides joined by a rectilinear stretcher.